About 10 years ago, I spent a lovely two weeks in Croatia on holiday with my sister and another friend when all three of us were young, free and single! I still have so many happy memories of the place. We travelled around quite a bit, and I wish I’d made a note of all the little towns and islands we visited at the time, as it annoys me that I can’t remember them all. I’ve since learnt my lesson and try to keep a journal when I’m away. I remember beautiful old buildings and cobbled streets, walking up steps and through the impressive gate to the old city in Korcula, buying trinkets and little lavender bags from market stalls, eating lots of bread and cheese on the beaches (buying little mats to lie on as the coastline is rocky rather than sandy, so not comfortable to lie on), losing a much loved bracelet, spying on all the people who could afford to own/stay on the huge gin-palaces (pleasure boats) in Hvar, walking the city walls in Dubrovnik, seeing bullet holes on old buildings and churches (a reminder of Milosevic’s attempts to build a “greater Serbia” in the 90s) and going on a Fish Picnic -a day trip on a boat where we were taken to the Blue Caves which had the most wonderfully clear bright blue water in them – it was fantastic. Whilst I remember eating lots of pizza in Croatia and that there was loads of seafood on the menu, I am ashamed to say that I don’t really remember the puddings (which is very unlike me). 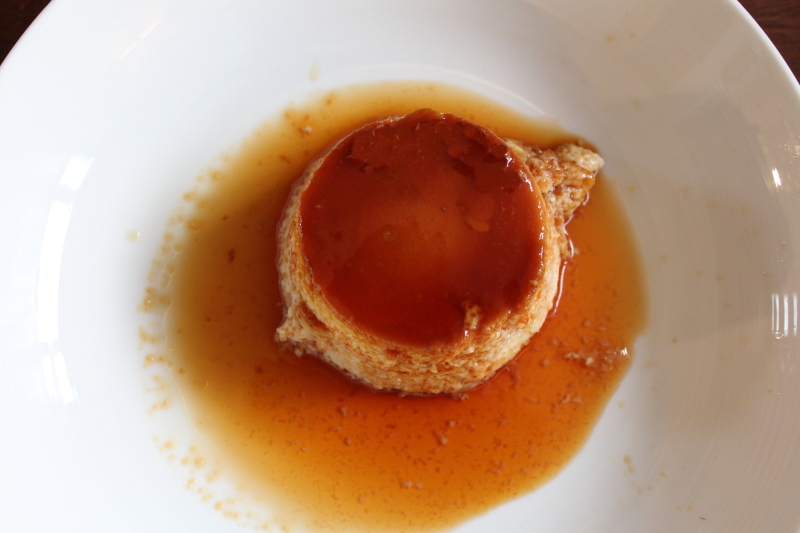 I picked this as it’s a traditional Croatian pudding from the Dubrovnik region and I love crème caramel. Having never made it before, I decided this was the perfect opportunity. Apparently Rozata is so-called because the ingredient that makes it so distinctive is rose liqueur (known as Rozulin). Don’t panic if you don’t have any, as all the recipes I found said you could substitute it for dark rum, which is exactly what I did, although I guess you don’t get the same uniqueness to the dish. I also didn’t have any vanilla sugar, so rather than go out and buy any (or make my own), I’m afraid I cheated and added about 1/4 tsp of vanilla extract when required (keeping the same quantity of sugar). Having not tried the pudding before, I’m don’t know if it had exactly the same taste as I had nothing to compare it to. I have to add that this wasn’t one of my finest creations (as you can clearly see from the photos), but one of the reasons for this challenge was to learn how to make new dishes and I’ve definitely learnt something with this one! I think this is one of the dishes I will have to try to make again for a number of reasons – 1) to get the caramel right, 2) to not overcook the custard, 3) when I get my hands on some vanilla sugar, and 4) if I ever track down rose liqueur. Not many reasons then!! I found this recipe on a lovely blog called BakeNoir (you should check it out) and have adapted it ever so slightly. NB My first attempt at caramel was not a success. Burnt sugar does not smell good (luckily I managed to save the saucepan!). I did a bit of reading and found this useful webpage by David Lebovitz that gave some tips on how to make the perfect caramel (briefly summarised below), which made my second attempt work so much better. However, next time I think I’ll add a couple of tablespoons of water in at the end as a lot of my caramel stuck to the bottom of the ramekins when I came to serve it, making me think the caramel was just that bit too hard. Put the sugar in a heavy-bottomed saucepan over a very low heat. When it starts to brown and liquefy at the edges, begin to drag the sugar to the middle to prevent it burning. It should start going a sort of dark-reddish brown colour. Try not to stir too much as the sugar all clumps together, but if you have it on a low heat, you can rescue it if too many lumps form. Once the sugar has dissolved completely, immediately (and carefully) divide the hot caramel among the ramekins. Be quick because the caramel hardens really fast. If you have time before it cools, swirl the caramel up the sides of the ramekins slightly so the sides are coated. Allow to cool. Preheat the oven to 150°C. In a medium saucepan, heat together milk and 6 tbsp sugar, stirring constantly until sugar dissolves. This won’t take very long and you want it on no more than a medium heat. Remove from heat and allow to cool. Meanwhile, whisk together eggs and vanilla sugar. Whisk until the mixture just comes together making sure it doesn’t froth. I read that it’s better to use a fork than a whisk as you create fewer bubbles. Add lemon zest and rose liqueur (or in my case the rum) and stir to combine. Finally, pour the milk in, mixing slowly to combine. Strain the custard through a sieve and pour into the ramekins. Sieving is important as it helps get rid of any remaining bubbles and also removes any bits such as the chalaza (from the egg), resulting in a smoother custard. Place the ramekins in a baking dish, making sure they don’t touch each other. Carefully pour boiling water [see my comment below] into the baking dish until 2/3 of the way up the sides of the ramekins. Be careful not to get any water on the custard. Bake for about 30 minutes, or until the custards are almost fully set. Remove from the oven and carefully remove the ramekins from the hot water bath. Let them cool to room temperature, then cover with cling film and refrigerate overnight. NB I must have been having a bad day as my custard didn’t work properly either. I think I must have over-cooked it or had the oven a bit too high, as it had that slightly curdled, rather than smooth look about it that you can see in the photos. It still tasted nice, just didn’t look very pretty. After doing a bit more reading around the subject, I would recommend using hot, rather than boiling, water in the bain-marie as I think this would stop the custard cooking as quickly – I’ll try that next time. To serve, carefully run a small palette knife round the edge of the ramekins to loosen the custard, place a serving dish on top of the ramekin and turn upside down. 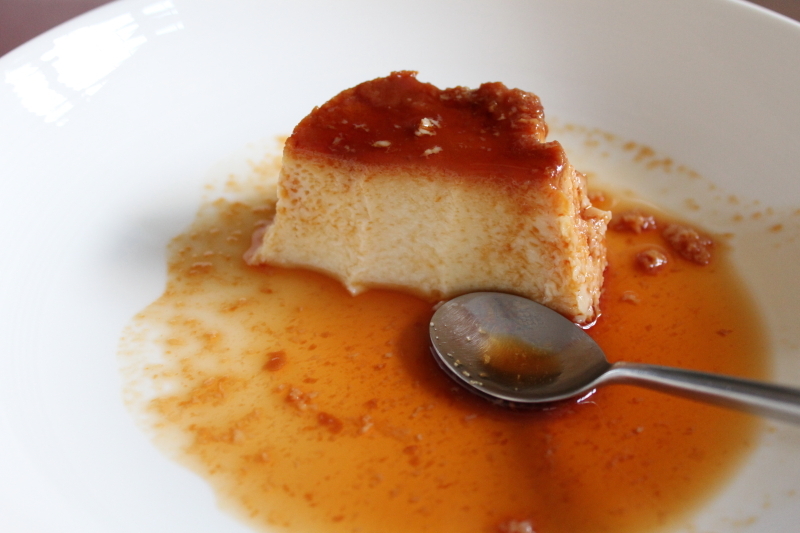 The caramel will pool around the inverted custards. Serve immediately. This looks such an awesome recipe I’m a massive fan of food and really want to try this. Will try it this weekend and will let you know how I get on. Top blogs by the way! Thanks Stevie! It did taste good too, just a bit over cooked! Would love to know if it works for you. Blog still v new so thanks for your comments and for stopping by!